THIS IS ONE OF THE BEST DISCOUNTS IN TOWN! IT WILL BE FULLY ACTIVE TOMORROW! Our members have some great perks in and around the Aquarium—discounts at the Gift Shop, Whale Watch and IMAX theatre, express admission and member-exclusive events. Sometimes we connect our members with special discounts to the theater, too! 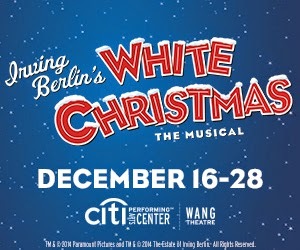 New England Aquarium members can receive 30%-off tickets to Irving Berlin's White Christmas! Visit citicenter.org/merry and enter code HOLIDAYS to buy your discounted tickets. This discount applies to select tickets and performances (12/16 7:30p, 12/17 7:30p, 12/18 7:30p, 12/19 8:00p, 12/21 6:30p, 12/23 7:30p, 12/24 2:00p, 12/28 6:30p) while supplies last.